FLORENCE, S.C. – Harvest Hope was “blessed” Thursday morning with 35,000 pounds of ribs – a donation from Smithfield Foods and W. Lee Flowers & Company. 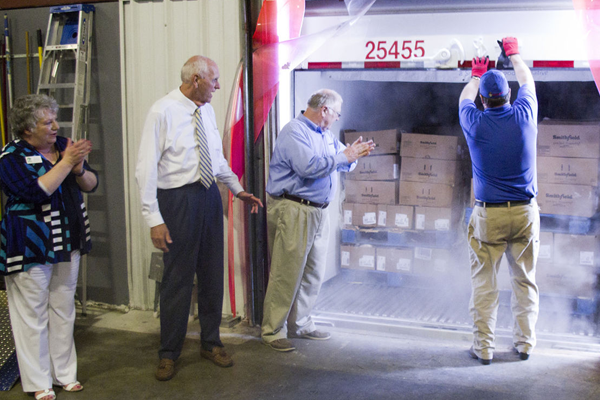 The food ultimately will provide approximately 200,000 meals to those in need in the Pee Dee. “Thirty-five thousand pounds is a huge blessing of protein, good, great meat product,” Harvest Hope chief executive officer Denise Holland said. “This is just a huge blessing. Pittman said helping hungry homes has found across the nation that protein is the most difficult thing for food banks to get. Harvest Hope provides roughly 100,000 meals per month in the Pee Dee, Holland said. “Meat is needed by hungry people, and we have a lot of people to feed in the Pee Dee,” she said. Pittman called on residents to step up to be a food bank volunteer or to have a food drive in their church or neighborhood. “This is all about people helping people,” he said. “Don't wait for someone else to do it. Smithfield, along with Feeding America Food Banks, needs your help in trying to stamp out hunger in the United States. Holland also called for donations to Harvest Hope. “One dollar provides five meals, and 98 cents of every dollar goes directly to feeding hungry people," Holland said of Harvest Hope.